The story of the prodigal's return can be found in every age and every community the world over. The specifics of the crisis arising from adjustments engendered thereby may vary according to time and place—death, divorce, injury, religious conversion, marriage outside the tribe—but MJ Kaufman's Sagittarius Ponderosa may be the first play of the 21st century to propose a daughter venturing forth from her home in the pine-forest wilderness of Oregon only to re-emerge from her pilgrimage in the shape of a son. At the play's beginning, the remaining traces of this dwindling clan are identified only by their filial purpose—father, mother, grandmother. As the story progresses, however, Mom is addressed as "Laur" (diminutive of "Laura"), Grandma's nursing-home companion refers to her as "Anna" and Pops takes on an additional cognomen drawn from the Greek myths before his death to depart this world under the sobriquet, "Robert Jason." Only Archer arrives fully metamorphosized, having forsaken the patronymic "Angela" and all other former appellations. "Kaufman identifies Archer as 'genderqueer' in his script—that is, as neither male nor female, but so far, I think I'm the only trans-identified actor in this region who's played Archer," observes Jaq Seifert, "I think that's important, because it brings an empathetic perspective to the role that a cisgendered performer might have more trouble achieving. Even [Kaufman] commented on this." Kaufman's script doesn't tell us much about the characters. Did you have to fabricate extensive backstories in the course of rehearsals? "Oh, yes! We decided that Angela had already come out as a lesbian to her family before going away to art school, and that both parents gave her the space to find her own way. I think Pops viewed Angela as the son he never had, and so, he approves Archer's male-approximating behavior, while Mom's hostile response to Grandma's bequeathing her gowns for her 'granddaughter's wedding' arises from the realization that she will never have a girl to dress up." What's important to note," Seifert insists, "is that for Angela, the struggle wasn't with gender identity, but the changing of the name. This play is all about names, naming things and the transformations we go through when we take on a different name—'alive' versus 'dead. Or 'old' versus 'young'." Kaufman leaves many questions unanswered—the significance of the virile young forest ranger with whom a lonely Archer finds affection, for example, or Grandma's nursing-home swain who eventually occupies a chair at family dinners. "The play talks about how nature 'recycles' something once useful into something new." Seifert muses, "We are constantly being recycled into a new level of consciousness--getting more rings in our trunk, so to speak. We never lose our place at the table, though. Archer isn't becoming his dad—he's becoming himself." Director James Fleming concurs, "Kaufman is resisting the traditional binary trans narrative—'I was Angela, but now I'm Archer'—in favor of celebrating life as a never-ending process of evolution." What, then, are audiences to take away from the play? Fleming and Seifert both answer right away, "An understanding of how it's often hardest to open up to the people to whom you're closest." 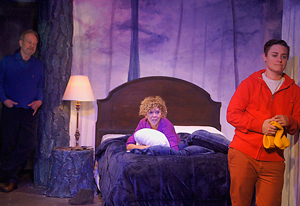 Sagittarius Ponderosa continues at Redtwist Theatre through July 29.